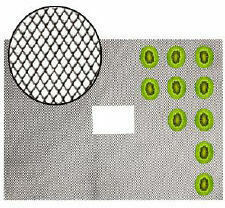 The mesh dehydrator netting is extremely useful when drying small items, fruits and vegetables. Simply cut a sheet to fit your dehydrator racks to keep small items from falling through. The dehydrator netting can be used at temperatures up to 175 F. Easy to clean and reusable thousands of times. 1 Roll.